Teach me to know your pathways and to walk faithfully, step by step. I know that what I have is borrowed goods, and all is yours. But I want your strong hand to lead me, and I will never stray from the final goal. 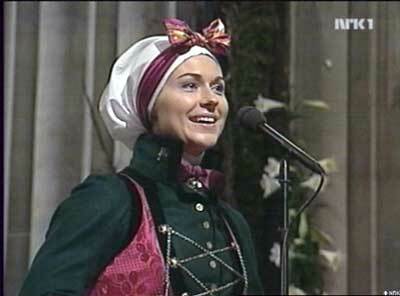 Sissel sang this lovely song at the royal wedding in Norway on May 24, 2002. It is appropriate that she sang this in the cathedral of Trondheim, which was the traditional Norwegian pilgrimage site. According to one account, "The wedding ceremony was between princess Märtha Louise and Ari Behn. Sissel performed beautifully 'Lær meg å kjenne dine veier' (Norwegian tune written in 1902 from Åseral in Vest-Agder) with help from the Trondheim Symphony Orchestra and the Nidaros Girls' Choir. In Norway it is tradition to wear a national costume (bunad) during special occasions, and Sissel followed the tradition wearing a green, Luster-bunad. About 1000 people attended the wedding ceremony in the the Gothic cathedral of Trondheim." Sissel at royal wedding. Photo: Screenshot NRK. Last updated November 10, 2002.